The caption reads: "The best thing about being a girls is now I don't have to pretend to be a boy." No son, you're a boy pretending to be a girl. I've not read anything beyond the cover of this foolishness, but is there any doubt that the biggest fools here are this boys parents? Ten to twenty years from now--if it even takes that long--we will almost certainly be reading of the tragic outcome of this sin, and tragically, it will be this boy who will have suffered the most. Let us pray that there are wise adults in his life who will lovingly, but firmly, tell him the truth. [T]here will never be a lasting gender revolution. Male-female relationships form the foundation of all societies, from romance to reproduction to parenting, and without those relationships, which include the celebration of gender distinctives, no society will flourish. One does not need an advanced degree in sociology, anthropology, psychology, or human sexuality to figure this out. 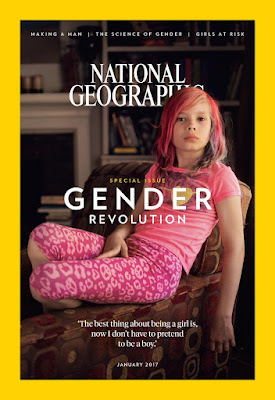 [I]t is irresponsible for National Geographic to put a confused 9-year-old child on the front cover of their magazine. Dr. Brown also details the attacks on the members of the medical community who are attempting to speak truth in this new front of the LGBT agenda. The whole piece is well worth the read. Again, as I noted with Brad Pitt and Angelina Jolie and their young daughter Shiloh, what is happening in these situations is nothing short of child abuse. Almost certainly this is not going to end well. Pray for this child and his family. Why is Israel So Hated?